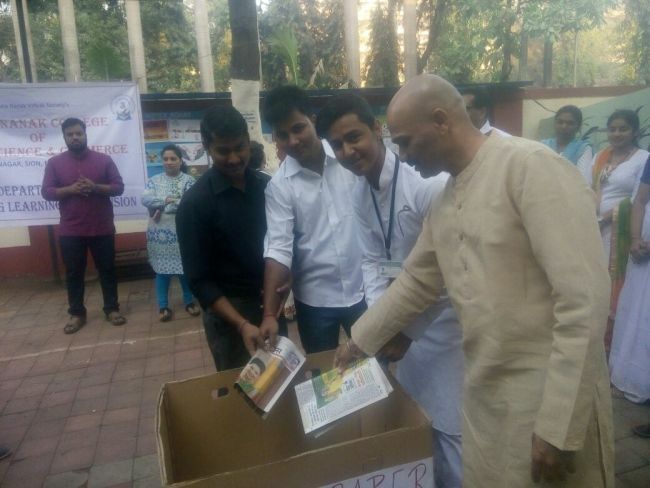 This Mumbai college is doing its best to save tonnes of garbage going into the landfills. Here’s the success story of the college. The city of 18.4 million people is running out of space for all its waste, and Deonar, Asia’s oldest and largest dumpsite, also city’s main landfill is bursting with no space to accumulate waste in any form. Mumbai produces approximately 9,400 tonnes of trash each day with more than half of it gets thrown at 180-foot-high Deonar landfill. In a bid to overcome city’s waste woes, students of Guru Nanak College of Arts, Science & Commerce in GTB Nagar of the city saved approximately 240 kgs of e-waste, 600 kgs of paper waste and reused eight lakh litres of water this year through its various environment friendly projects. Apart from this, the college has adopted GTB Nagar station as part of its Swachh Bharat mission, and does weekly cleanups there and to make people aware about different environment issues like why maintaining hygiene and cleanliness is important, why usage of plastic should be restricted, waste segregation and benefits of composting to name a few. We take care of our homes perfectly but the same approach is not there when it comes to our environment. I wanted to change this dark reality, that’s when I thought of making our college deeply involved in all these eco-friendly practices. As what is better then involving students and imparting Swachh knowledge in them, says Dr Vijay Dabholkar, Principal Guru Nanak College of Arts, Science & Commerce. 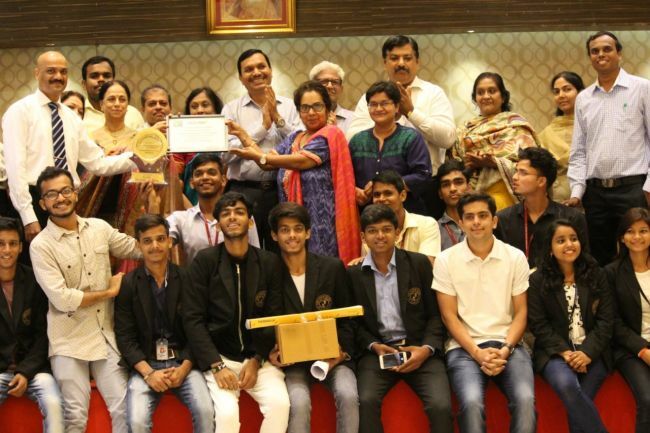 From organising campaigns to motivate and educate students about various environmental issues to holding creative competitions to find sustainable solutions, the college has done it all. Explaining the process of waste segregation, Dr Meetali Dasgupta, coordinator, environment mentoring committee of the college said, Organic garbage, mostly from canteen in the college is converted into manure through the process of composting. The manure is then used for gardening purposes within the campus. Following this process we save up to 50 kgs of wet waste in a month. This is our way to motivate children in learning the importance of waste segregation at source. Moreover, the students of the college are also involved with the Brihanmumbai Municipal Corporation’s door-to-door waste segregation campaign in Mumbai. Apart from that, these students every now and then conducts waste segregation campaigns on their own just to make Mumbaikars aware about the process. We have learned the importance of waste segregation in our college, we want to make sure every citizen of Mumbai learns the same, said Sangam Agarahi, a student of 3rd year in Guru Nanak College of Arts, Science & Commerce. The campus also launched a paper recycling project five years ago with an aim to save and recycle waste paper. Another dry waste recycling project was started in 2014 with an aim to reduce and recycle e-waste. The college in a Memorandum of Understanding with two NGOs started the mission of recycling dry waste – NGO Eco-Rox for recycling paper waste and Sampurna, an e-solutions to recycle e-waste. Approximately 600 kgs of paper waste and around 240 kgs of e-waste is recycled every year by the college, added Dr Dasgupta. Talking about the e-waste campaign, Rajin Kumar, a student from the college added, We got to know about the concept of recycling dry waste and its importance towards the growth of the society in our college, that’s when we started imparting what we learned inside the campus tothe outside world. We wanted to make the e-waste campaign big knowing its harm to the environment; we reached out to different companies, apartments to ask for their e-waste. Getting their trash was a challenging task, they all were reluctant to handover the waste, even when it was of no use to them, but, our continuous efforts helped in gaining the success. Apart from these activities which helped in tackling tonnes of waste, the college has also reduced its dependence on electricity which is generated using conventional fossile fuel , which releases carbon and other pollutants into the air. The college has set up 5 kilowatt hour (kWh) rooftop solar system that helps in generating electricity for lights and fans on the entire ground floor of the campus. The college has saved eight lakh litres of water this year through its rainwater harvesting project. The 16,000-sq-ft terrace of the college’s building acts as an area where water can be collected, which then gets into the underground tanks and is used in washrooms. The college also organises competitions related to environment every year around themes like best out of waste, where students are encouraged to upcycle waste and use it in different forms, also students are given topic related to waste and environment and are asked to come up with solutions through PPT presentations. The college is currently celebrating the ganeshotsav that started from August 25. The students currently goes out and collect the flower waste from all the 70 mandals in GTB Nagar in order to compost the flower waste in their campus. We want to educate as many students as possible and make them aware about the environment so as they can take steps to conserve it. At our campus, Swachh initiatives are continuous, we plan to tie up with the BMC for collection of e-waste and make it big, signs off Dr Vijay Dabholkar. Previous Post: This 25-Year-Old From Mumbai Knows How To Use Discarded Plastic Bottles Innovatively.